Sanofi has had a rough three years, but it has now declared that its patent cliff period has passed. However, the key to its future growth could rely heavily on two of its fastest growing business segments -- diabetes care and Genzyme. Pharmaceutical giant Sanofi (NASDAQ:SNY) recently reported its third-quarter earnings, in which it proclaimed that its patent cliff period was over, and that it was well-positioned to grow again. However, Sanofi's earnings report and outlook still paint a mixed picture. During the third quarter, Sanofi's earnings declined 19% year over year to 1.35 euros ($1.85) per share. On a constant currency basis, earnings declined 9%. The company's revenue slid 6.7% to 8.4 billion euros ($11.5 billion) on a reported basis, but rose 0.6% on a constant currency basis. 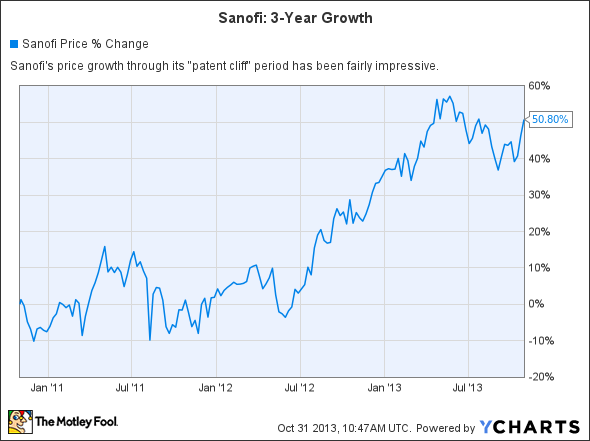 Did Sanofi survive its patent cliff? Over the past three years, Sanofi investors have been worried about the patent expirations of nine of its top-selling drugs, including Plavix, Avapro/Aprovel, Lovenox, and Eloxatin. As seen in this year-over-year comparison of year-to-date sales, generic competition took a pretty big bite out Sanofi's top line throughout 2013. Source: Sanofi third-quarter earnings report. Declining sales of Plavix and Avapro have also been a major concern for Sanofi's marketing partner for both products, Bristol-Myers Squibb (NYSE:BMY). Last October, Bristol-Myers returned most of its global marketing rights to Sanofi, but retained the rights to Plavix in the United States and Puerto Rico and still receives royalties from global sales. Together, sales of these four products still account for 13% of Sanofi's quarterly revenue, but their importance to the top line has waned considerably. However, Sanofi's top line is still declining. To reverse these losses, Sanofi has been emphasizing the development of its "Growth Platforms" group, which consists of six business segments -- diabetes, vaccines, consumer health care, Genzyme, animal health, and other innovative products -- along with its combined sales of all the aforementioned products in emerging markets. Together, these six segments and emerging markets sales accounted for 74% of Sanofi's third quarter revenue -- up from 71% in the prior year quarter. Total Growth Platform sales rose 5% year over year. However, growth across these segments is very uneven, and investors should watch two key areas closely -- its diabetes franchise and Genzyme -- to better gauge Sanofi's future. It's clear that Sanofi's diabetes segment is the most important. In that segment, its insulin analog Lantus is the top seller, posting 21.2% year-over-year growth and accounting for 87% of the diabetes franchise's sales. However, it's also a product that faces rising competition from Novo Nordisk (NYSE:NVO) and Eli Lilly (NYSE:LLY), which both manufacture popular insulin analogs. Insulin analogs are considered superior to human insulin, since the duration can be modified for shorter or longer- lasting doses. Novo Nordisk generates the majority of its revenue from three insulin analogs -- NovoRapid/NovoLog, NovoMix, and Levemir. During the first nine months of fiscal 2013, sales of those three products rose 9%, 5%, and 18%, respectively, from the previous year. Meanwhile, Eli Lilly's insulin analog, Humalog, posted 7% year-over-year sales growth last quarter. To diversify its diabetes segment away from Lantus, Sanofi is focusing on its new GLP-1 drug, Lyxumia, which is currently approved in parts of Europe, Japan, and Mexico. GLP-1 receptors are a new class of drugs, which stimulates natural insulin production to keep blood sugar levels under control. However, the GLP-1 receptor market is already crowded -- Novo Nordisk's Victoza and AstraZeneca/Bristol-Myers Squibb's Byetta/Bydureon are approved competitors, while Eli Lilly's dulaglutide has also shown promise in clinical trials. To top that off, newer blood-sugar reducing treatments like Merck's Januvia and Johnson & Johnson's Invokana are also competing against GLP-1 drugs. Therefore, considering that Sanofi's Lyxumia only generated 3 million euros ($4.1 million) in sales last quarter, it's tough to see it becoming a new pillar of growth for its diabetes business. Another key area of growth is Genzyme, Sanofi's business for treatments of rare diseases and multiple sclerosis, which reported 21% year-over-year sales growth. Cerezyme, a treatment for Gaucher disease, is Genzyme's top seller, posting 8.6% year-over-year growth to €165 million ($226 million) and accounting for 31% of the segment's sales. Sales of Cerezyme increased by 37% in emerging markets, compared to 6.7% growth in the United States. Genzyme's fastest growing treatment is the Fabry disease treatment Fabrazyme, which reported 19.5% sales growth during the quarter to €96 million ($132 million), fueled by 50% growth in western Europe, and 20.5% growth in the United States. Those two drugs, along with the Pompe disease treatment Myozyme and MPSI treatment Aldurazyme, should help Genzyme continue to post double-digit growth. Meanwhile, sales of Genzyme's orally administered multiple sclerosis or MS treatment Aubagio, which generated €44 million ($60 million) in sales last quarter, could soon decline due to the launch of Biogen's (NASDAQ:BIIB) Tecfidera, a competing treatment which has a better side effect profile. As a result, Tecfidera is expected to become a blockbuster drug with annual peak sales of $3.5 billion by 2016 -- much of which will come at the expense of Sanofi and Novartis, which manufactures Gilenya, the only other approved oral MS drug on the market. In closing, Sanofi's diabetes business and Genzyme are the two fastest growing parts of the company and should be watched closely. In the diabetes segment, investors should keep an eye on Lantus and see if Sanofi is successful in diversifying its portfolio into other treatments such as GLP-1 drugs. In Genzyme, investors should see if its treatments for rare diseases will continue growing, and offset an expected decline in Aubagio. Investors should also see if Sanofi's sales pick up in Brazil, where it faces generic competition, and China, where it faces a pharmaceutical slowdown exacerbated by a government probe of foreign drugmakers. Both markets are key components in Sanofi's emerging markets strategy, but neither paid off during the quarter as total sales in emerging markets slid 1.5%. Therefore, although the worst days have passed for Sanofi, the company still has to prove that its best days are ahead.